Don't go boating if you don't like water! We had a great Crick show!! Lovely day Saturday, (but it was so busy) and wet Sunday and Monday (but it kept the crowds away) This gave us the chance to have a good look round and get on all the boats, and there were loads of them. Funny enough, we didn't buy much, but got loads of ideas. We have been working on the scrape book and putting all the things we like in it, to show Fernwood what we want Derwent6 to look like inside. Talking of Fernwood Craft, they celebrated their 10th Anniversary at Crick, where all their customers and suppliers got together. Food, drink and fun was had by all and it gave us the chance to get everyone's experience of the waterways. I'm sure something will be in one of the magazines. Here is Julia holding the cake. What did we get out of the Show! We now know what floor we want, what mattress we want, how we want the engine room to look, what generator, what radiators, insurance and the list goes on. But we now can't decide on the woodburner fire, we like the corner bubble for space, but love the Morso squirrel for looks and effectiveness. We had a long chat with Beta marine about the engine because they have just brought out the new travel pack with the 5kW generator. We got the chance to hear it running and it was very impressive, so quiet, with no vibration. Got to have one of them!!! We got to meet up with our hull builder, Jim Sparks but not with good news. Jim is now ready to build our shell but Ken and Julia don't need it until August so the start date may not be until the end of June now. We were so disappointed, but we will probably need the time. Jim does not want to start the shell and then it has to be sitting out in the elements, waiting to get into Fernwood's workshop, and we certainly don't want that either. One good thing about the show is you get the chance to meet people, bloggers and all. Hi to Fiona & John from n.b Epiphany working hard on the Bath narrowboat stand....it was great to meet you guys, and Hi to Lorraine and Mark on n.b Lorimar....it was great to meet you too and your boat is stunning! Can you believe it !! It's May already!! Well we're dancing round the may pole already, but we Maybe getting a call soon, saying the steel has been ordered by Jim Sparks' our hull builder, so we have been looking at all the changes that we want Jim to make. These are things like the size of portholes, size of cratch lockers, bow deck drainage, bow design, position of mushroom vents and houdini hatches. Also how the fenders are fixed and their location, side door positions, roof rail cutouts and stern deck and roof hatches. Difficult to get your breath back after all that lot!!!! We have drafted up a little booklet for Jim to use, so he knows exactly how we want Derwent6 to look. For example! 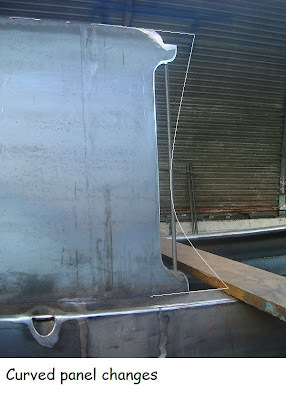 Jim has these rails fitted to the bow sides which we don't want, so I have drawn it how we want it. We also want roof fenders with cutouts in the roof rails, so the fenders can be put up when travelling. 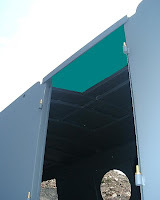 and a square roof hatch fitted to the side doors. We are now working on a scrapbook for the interior.